The Lawrence Berkeley National Laboratory (Berkeley Lab) Laser Safety Program is designed to prevent staff exposure to laser radiation in excess of the maximum permissible exposure (MPE) limit for the human eye or skin, and to ensure a safe working environment for laser-related research by effectively mitigating laser-related hazards. The purpose of this document is to provide guidance for the safe use of lasers and laser systems operating between wavelengths of 180 nm to 1 mm. It provides basic laser safety information and describes specific laser-system safety requirements following the guidance set forth by the American National Standard for the Safe Use of Lasers (ANSI Z136.1-2014). Exclusion: This policy does not apply to commercially available Class 1 products for use by the general public unless opened, serviced, or modified. Examples of lasers not covered by this policy include compact disc players and laser printers. While misuse of these lasers may present a hazard, it is generally accepted that the risk of injury from these devices is minimal if used as intended by the manufacturer. All work with lasers and laser systems must be authorized before it is performed (See PUB-3000 Chapter 6, Work Planning and Control). The work authorization document is maintained as an electronic record in the WPC Activity Manager database. Performs and documents a laser-safety assessment of all Class 3B or Class 4 lasers used in the activity. The assessment is documented using the Laser Operations Audit Form or a similar process. 3. The LSO may delegate the duties listed above to a Deputy LSO (DLSO) or another responsible person. “There shall be a designated LSO for all circumstances of operation, maintenance, and service of a Class 3B or Class 4 laser or laser systems. The ANSI Z136.1 Safe Use of Lasers standard recognizes that its classification and control scheme relates specifically to the laser product and its potential hazards, based on laser-operating characteristics. The basis of the hazard classification scheme is the ability of the laser beam to cause biological damage to the eye or skin during use. Can operate over two or more wavelength regions shall be classified for each spectral region of operation. The appropriate control measures for each region shall be applied. However, if the laser has been modified subsequent to classification by the manufacturer, the laser may have to be reclassified. The ANSI Z136.1 Safe Use of Lasers assigns major responsibility for such judgments to the Laser Safety Officer. Considered incapable of producing damaging radiation levels during operation. Exempt from any control measures. Laser or laser system containing higher-class laser(s) that cannot emit accessible laser radiation during operation in excess of the Class 1 accessible emission limit (AEL) for any emission duration. Considered incapable of producing hazardous exposure conditions during normal operations unless the beam is viewed with collecting optics, such as an eye-loupe (diverging beam) or telescope (collimated beam). Exempt from any control measures other than to prevent potentially hazardous optically aided viewing or unattended operation where the beam is directed into a location directly viewed by the general public and/or personnel that may be uninformed about the hazards. Emits in the visible portion of the spectrum (400 nm – 700 nm). Eye protection is normally afforded by the aversion response (0.25 seconds), but eye injury is possible in case of intentional prolonged exposure. Maximum AEL for continuous wave (CW) point source is limited to 1 mW. Exempt from any control measures except for intentional direct viewing of the beam. Eye protection is normally afforded by the aversion response for unaided viewing. Potentially hazardous if viewed with collecting optics (e.g., telescope). Emitted radiation may be visible or invisible. May be hazardous under direct and specular reflection viewing conditions but is normally not a diffuse reflection or fire hazard. Potentially hazardous under some direct and specular reflection viewing conditions if the eye is appropriately focused and stable, but the probability of an actual injury is small. Will not pose either a fire hazard or diffuse reflection hazard. Have an accessible output 1 to 5 times the Class 1 AEL for wavelengths shorter than 400 nm or longer than 700 nm, or less than 5 times the Class 2 AEL for visible lasers 400 nm to 700 nm. Exempt from any control measures except for during intentional direct viewing of the beam or its specular reflection, and during unattended operation with the beam directed into a location where it can be directly viewed either by the general public or other personnel who may be uninformed about its hazards. May be hazardous under direct and specular reflection viewing conditions but is normally not a diffuse reflection or fire hazard. Emitted radiation has intensity greater than Class 3R. Maximum average power is less than 500 mW (can be lower for pulsed lasers). Accessible radiant energy per pulse shall not exceed 0.125 J. A Class 3B laser system requires the approval of appropriate control measures by the LSO in order to reduce the risk of a hazardous exposure to the eye from a direct or specularly reflected beam. Poses a hazard to eye or skin from the direct beam. May pose a diffuse reflection or fire hazard. May produce laser-generated air contaminants (LGAC) and hazardous plasma radiation at very high intensities. Emitted radiation has intensity greater than Class 3B AEL. A Class 4 laser system requires the approval of appropriate control measures by the LSO in order to reduce the risk of a hazardous exposure to the eye or skin from a direct, specularly reflected, or diffusely reflected beam. Control measures may also be required for potential fire hazards and other non-beam hazards such as LGAC and hazardous plasma radiation. Prevent staff exposure to unsafe laser radiation. Ensure a safe working environment for laser-related research. Ensure, per Berkeley Lab’s policy on laser safety, that all lasers and laser systems are operated in a manner that complies with the American National Standards Institute (ANSI) Z136.1 Safe Use of Lasers. In order to implement the policy and give the researchers flexibility in choosing controls, the operations of Class 1, 1M, 2, 2M, and 3R lasers at Berkeley Lab may be reviewed by the Laser Safety Officer (LSO). All circumstances of operation, maintenance, and service of a Class 3B or Class 4 laser or laser systems shall be reviewed and approved by the LSO. This includes the service and maintenance of Class 3B and 4 lasers embedded into a Class 1 product. The LSO approval is expressed as giving a concurrence (a “thumbs-up”) in the WPC Activity Manager during the hazard evaluation and authorization process. The LSO may develop and issue laser protocols. Protocols are interpretations of ANSI Z136.1 requirements. Protocols will be reviewed and concurrence given by the Berkeley Lab Laser Safety Committee to ensure they provide equivalent protection and fit into Berkeley Lab’s research environment and needs. As appropriate, they will be forwarded to the Berkeley Lab Safety Advisory Committee (SAC) for institutional review and concurrence. Prior to being implemented, protocols are submitted for review to the U.S. Department of Energy (DOE) Berkeley Site Office (BSO). Protocols are posted on the Laser Safety Web page. The probability of personnel exposure to hazardous laser radiation shall be considered. This may be influenced by whether the laser is used indoors or outdoors. Examples of indoor applications include research laboratories, machine shops, and classrooms. Examples of outdoor applications include laser use in laser light shows, military laser ranges, free-space communications, or in outer space. After a total hazard evaluation, including other environmental hazards, the LSO will decide on the control measures mitigating the hazard. Where applicable (e.g., in the presence of an unenclosed Class 3B and 4 beam path), the LSO may specify the Nominal Hazard Zone [NHZ]). The LSO shall ensure that considerations are given to direct, reflected, and scattered radiation when establishing boundaries for the Laser Controlled Area (LCA). The LCA may be a dedicated laser-use room or area defined by laser curtains or partitions. Control measures are required within the LCA and may fully enclose the NHZ when this area is limited in size. Viewing the main beam or a specular laser target with an optical instrument is potentially hazardous due to the instrument's light-gathering capability. Therefore, use of such optical systems may effectively increase the NHZ boundaries and shall be considered in the overall hazard evaluation. The total hazard evaluation of a particular laser system depends on the extent of several potentially hazardous conditions. In this evaluation, the LSO will consider all optics that are a permanent part of the laser beam path and will consult ANSI Z136.6 and Federal Aviation Administration (FAA) JO 7400.2K Part 6, Chapter 29 Outdoor Laser Operations for guidelines on using lasers safely in an outdoor environment. Personnel, including maintenance and service personnel, visitors, and operators, who may be in the vicinity of a laser and its emitted beam(s), can influence the total hazard evaluation and, therefore, influence the decision to adopt additional control measures. For certain lasers or laser systems (e.g., lasers in a research setting, and some lasers used in the construction industry), the principal hazard control rests with the operator, whose responsibility is to avoid aiming the laser at personnel or at flat mirror-like surfaces. No one shall be exposed to laser radiation levels exceeding the applicable maximum permissible exposure (MPE) under any reasonable conditions of operations except for those lasers or laser systems designated for use in health care. Therefore, control measures commensurate with the hazard shall be devised to reduce the possibility of exposure of the eye or skin to hazardous levels of radiation. These also include other hazards associated with the operation of laser systems during operation and maintenance. For all uses of lasers and laser systems, the minimum laser radiation necessary for the intended application should be used. Class 1, 1M, 2, 2M, and 3R lasers and laser systems are listed in Section 16.4, Laser Classification, of this PUB-3000 chapter. All Class 3B and 4 lasers or laser systems in active use require the review and approval of appropriate control measures by the LSO. A detailed list of control measures for the safe use of Class 3B and 4 lasers can be found in Work Process G of this PUB-3000 chapter. The LSO may require additional control measures. In such cases, more than one control measure that accomplishes the same purpose will not be required. All control measures will be specified in the WPC Activity Manager. Control measures are divided into three groups: engineering, administrative (procedural), and personal protective equipment (PPE). If engineering controls are impractical or inadequate, an effective combination of administrative controls and PPE shall be used. PPE shall be used when mitigation cannot adequately be ensured by engineering and/or administrative control measures. Engineering and PPE control measures may require procedural application. When the primary control measures are not feasible or practical, ANSI Z136.1 Safe Use of Lasers gives the LSO authority to recommend or approve substitute or alternate control measures that provide equivalent protection. The approval of substitute or alternate controls must be incorporated and documented into the WPC activity. Examples would include the use of a curtain maze or use of administrative control such as warning signs in place of an entrance interlock. If an alternate control measure is used, all personnel shall be provided with appropriate laser safety and operational training. U.S. federal law requires that all laser products sold, imported, or otherwise distributed to users comply with the Federal Laser Product Performance Standard (FLPPS). These laser products are certified by their manufacturers, and are reported to the U.S. Food and Drug Administration (FDA) Center for Devices and Radiological Health (CDRH). Those who use these laser products as intended by their manufacturers may rely to some extent on the built-in manufacturer control measures. However, lasers or laser systems assembled in-house as well as certified Class 3B or 4 laser products may need additional engineering controls or additional labels to be applied. The LSO shall assess the adequacy of the CDRH required engineering controls and labeling in the installation as the product will be used and shall require additional engineering controls or labels as appropriate. User controls are those control measures implemented by the user in addition to the manufacturer control measures to render safe operation, maintenance, and service. The selection and implementation of specific control measures depend on how the laser system is being used. Service and maintenance may require access to hazardous laser radiation not accessible during the operation function. During periods of service or maintenance, control measures appropriate to the class of the embedded laser shall be implemented when the beam enclosures are removed and beam access is possible. Instructions for the safe operation of lasers and laser systems are provided by the manufacturer. Under some conditions, however, such instructions may not be sufficiently detailed for specific application due to special use conditions. In this case, the LSO shall provide additional safety instructions. A supervising laser operator maintains visual observation (including the use of surveillance devices) of the entire Laser Controlled Area during all conditions of operation and terminates laser emission in the event of equipment malfunction or any other condition of unsafe use. Unsupervised Class 1M, Class 2, Class 2M, or Class 3R laser systems shall be marked with a clearly visible manufacturer label that includes the applicable laser information and warnings. The unattended use of Class 3B or 4 lasers or laser systems shall be permitted only when the LSO has implemented appropriate control measures such as beam blocks, barriers, windows, other means of area control, or laser safety training that provide adequate protection to those who may enter the Laser Controlled Area during times of unattended use. Laser radiation accessible from unsupervised Class 3B or 4 lasers shall be limited so that unprotected spectators in the area shall not be exposed to levels that exceed the applicable MPE. Additionally, all areas where unattended Class 3B or 4 lasers or laser systems operate shall be marked with laser-safety area warning signs containing "Warning” as a signal word and appropriate instructions regarding the hazards of entry into the space when no operator is present. A Laser Controlled Area (LCA) is a laser use area where the occupancy and activity of those within are controlled and supervised. This area may be defined by walls, barriers, or other means. Within this area, potentially hazardous beam exposure is possible. Control measures are required within the LCA. Consideration is given to direct, reflected, and scattered radiation when establishing LCA boundaries. A detailed list of Class 3B and 4 laser control measures within a controlled area can be found in Work Process G.
A TCA allows a temporary authorization of laser work in a variety of unique settings, such as the removal of panels or protective housings, the overriding of protective housing interlocks, or entry into the NHZ during service where the accessible laser radiation exceeds the applicable MPE. In those conditions, a Temporary Laser Controlled Area shall be devised for the laser or laser system. Within the TCA, all control measures and requirements for Class 3B and 4 lasers apply (See Work Process G). Note: In the case when a Class 1 system with embedded Class 3B and 4 lasers is serviced and a TCA is established, the area outside the temporary area remains Class 1 while the area within is either Class 3B or Class 4. The exterior boundary of a Temporary Laser Controlled Area shall be posted with a Notice sign. A Temporary Work Authorization may be needed in cases where short-term laser work is performed, or laser work has not been authorized yet by the WPC Activity Manager. Line management develops the TWA with the LSO’s assistance, listing the circumstances and control measures to be followed by all parties within the temporary controlled area. The TWA is issued for the shortest and most practical time with the maximum duration of six weeks in a calendar year for the same activity. All parties read and sign the TWA, indicating that they understand the controls and will abide by them. Line management authorizes the work by signing off on the TWA. The TWA is posted at the work site for the duration of the authorized work. A copy of the signed TWA is emailed, faxed, or mailed to the LSO for record keeping. No unattended open-beam work is allowed. Alignment must be performed at minimum laser power or with lower class lasers. Anyone manipulating the laser(s) or optics must have completed laser safety training such as EHS302 Laser Safety Training, or the equivalent (approved by LSO). Laser protective eyewear with appropriate OD must be worn when open beams are present. Laser curtains defining the TCA must completely surround the laser system setup. All Class 3B and 4 lasers in active use must be registered with the LSO and entered in the Laser Management System (LMS), which is also called the Laser Inventory. This includes lasers brought on site by visitors or on loan from a different institution or manufacturer. It is the responsibility of the activity lead or laser user to notify the LSO of any new lasers coming to or leaving Berkeley Lab. The activity lead must provide all necessary information with laser parameters such as laser type, wavelength, power or energy, pulse repetition and duration, serial and DOE number. To register the laser, the Registration Form on the Laser Safety web page should be used. A technical brochure with the manufacturer’s specifications will be helpful. Once the laser is entered in the LMS, it can be added to the WPC Activity and then authorized for use after LSO hazard evaluation. The activity lead is responsible for updating the WPC activity to reflect the status of the laser and remove it from the activity when it is not in use (waiting for repair, sent to salvage, etc.). A laser or laser system may be developed or modified by a user for internal use only. User-developed or user-modified laser products shall have their engineering controls reviewed and approved by the LSO to determine the adequacy of their protection. On occasion, Berkeley Lab lends lasers and laser systems to off-site organizations or individuals, or a laser user takes them for research at different institution. It is a responsibility of the activity lead or laser user to notify the LSO for an evaluation and update the laser status in the WPC. Exceptions to the required LSO evaluation include unmodified commercially available consumer products, such as laser pointers, laser gun sights, laser printers, compact disc players, and barcode scanners, or units being returned to the original manufacturer or qualified service company for repair, maintenance, warranty work, modification, or similar circumstances. The LSO will verify that the off-site organization receiving a Class 3B or 4 laser(s) has an established laser safety program with an appointed LSO. The Activity lead or laser user should check the Property Management requirements for loaning equipment. A “Request for Transfer” or “Equipment Loan Agreement” may be required. It is expected that DOE/Berkeley Lab property will be returned to Berkeley Lab for future use. Upon the laser’s return, the activity lead must update the WPC and notify the LSO. Laser users have an obligation to ensure the safe and responsible disposal of all laser classes, especially Class 3B or Class 4 lasers and laser components. Returning the laser or laser system to the original manufacturer, or to a vendor specializing in reselling used laser equipment. Notify the LSO to update the laser inventory. Send the laser to Berkeley Lab Excess (Salvage), or eliminate the possibility of activating the laser by removing all means by which it can be electrically activated. The laser may then be discarded. If hazardous material in the laser components is present (e.g., mercury switches, oils, organic dyes), contact the waste generator to ensure proper disposal and compliance with the applicable hazardous waste disposal regulations. Notify the LSO to update the laser inventory. Transfer the laser to another DOE organization. A Request to Transfer form from the Property Management web page is needed. DOE does not donate equipment to non-DOE organizations. It must be transferred to a DOE grant. The custodian must contact the institution to find out if there was a DOE grant they could use. The lasers or laser systems must not be moved off site or given to any other organization without evaluation by the LSO. The LSO will assist the donor in determining if the laser or laser system complies with all applicable product safety standards, such as the FLPPS, and adequate instructions for safe operation and maintenance have been provided. The donor will also verify that the receiving organization has a viable laser safety program for the class of laser being donated, and ensure that the receiving organization contacts the Berkeley Lab LSO. More details on laser disposal can be found in the Laser Disposal Guide article on the Laser Safety web page. Proper waste disposal of contaminated laser-related material, such as flue and smoke filters, organic dyes, and solvent solutions shall be handled in conformance with appropriate federal, state, and local guidelines. Contact your waste generator to ensure proper disposal. All lasers and laser systems used outdoors shall meet the requirements found in ANSI Z136.6. The LSO shall affect a laser hazard analysis to establish the NHZ if it is not provided by the manufacturer and implement all appropriate controls. If visible lasers are used at night, the LSO shall determine whether the laser beams will visually interfere with critical tasks. For the operation of visible lasers at night near airports, the Federal Aviation Administration (FAA) Order JO 7400.2 and ANSI Z136.6 shall be referred to. The NHZ shall be clearly posted with laser warning signs. All personnel authorized to enter the NHZ shall be appropriately trained. Only authorized personnel shall operate a laser or laser system. An appropriate combination of administrative and engineering controls, such as physical barriers, screens, and PPE, shall be provided and used by the authorized personnel within the NHZ. Directing the laser beam toward automobiles, aircraft, or other manned structures or vehicles shall be prohibited unless adequate training and protective equipment is provided and used by affected personnel, or as authorized by the LSO and permitted by FAA Order JO 7400.2. The exposed laser beam path shall not be maintained at or near personnel eye level without specific authorization of the LSO. The beam path shall be confined and terminated wherever possible. When the laser is not being used, it shall be disabled in a manner that prevents unauthorized use. FAA is responsible for regulating the use and efficient utilization of navigable airspace to ensure the safety of aircraft and the protection of people and property on the ground. Laser uses that involve use of lasers or laser systems in navigable airspace should be coordinated with the FAA (Washington, D.C., or any regional FAA office). Laser-light-show demonstrations that use Class 3B and 4 laser systems to create visible open beams shall coordinate with the FDA prior to use. The operation of Class 4 lasers or laser systems in the rain, snow, fog, or a dusty atmosphere may produce hazardous scattering near the beam. In such conditions, the LSO shall evaluate the need for, and specify the use of, appropriate PPE. Scanning devices, including rotating mirrored balls, shall incorporate a means to prevent laser emission if scan failure or another failure resulting in a change in either scan velocity or amplitude would result in exposures above the MPE. All written WPC activities shall address non-beam hazards as well as beam hazards. They can be part of the laser activities or addressed in separate activities. Due to the diversity of the NBH, the LSO will assist in identifying common types of non-beam hazards so that the activity lead may consult the appropriate safety professionals and other subject matter experts as needed. More information about non-beam hazards can be found on the Laser Safety web page. By definition, the MPE values are below known hazardous levels. Exposure to levels at the MPE value may be uncomfortable to view or feel upon the skin. Thus, it is good practice to maintain exposure levels sufficiently below the MPE to avoid discomfort. The LSO will evaluate the laser setup and will determine the MPE and the needed OD for full-protection laser eyewear. The LSO or any person conducting the MPE calculations must refer to ANSI Z136.1 for guidance. ANSI provides tables with specific MPEs for different wavelengths, types of sources and exposure, as well as correction factors that need to be applied in different situations. When the borders of an NHZ cannot be determined from an analysis of the beam parameters. If measurements or calculations are required, a distinction shall first be made between point source viewing and extended source viewing in the 400 nm to 1400 nm wavelength region. For laser classification in the 302 nm to 2800 nm wavelength region, beam measurements shall be made at the point of greatest hazard but no closer than 2 meters from the point of closest access. In measuring the irradiance or radiant exposure from ultraviolet and far infrared diffuse sources, care shall be taken to make sure that the field of view of the instrument is adequate to ensure the required accuracy of measurement (Refer to ANSI for all tables and details). Many optical power, energy, pulse shape, and pulse repetition frequency (PRF) measuring devices available commercially can be used. Instruments shall be calibrated sufficiently well to permit overall measurement accuracies of ± 20% wherever possible. If measurements are performed, the uncertainty of the instrumentation should be traceable to national standards, either directly to the National Institute of Standards and Technology (NIST) or to other transfer standards traceable to NIST. Measurements should be attempted only by personnel trained or experienced in laser technology and radiometry. Enclosure of the laser equipment or beam path is the preferred method of control since the enclosure will isolate or minimize the hazard. When other control measures are not practical, personal protective equipment (PPE) shall be used to provide protection against laser radiation. Laser eye protection (LEP) shall be used for Class 3B and Class 4 lasers and laser systems. Clothing and gloves that have been specifically selected for suitable protection against laser radiation should be considered. The energy emitted from a laser or the reflection of a laser beam can present a highly concentrated energy source, sufficient to cause permanent eye injury. Eye protection devices are specifically designed for protection against radiation from Class 3B and Class 4 lasers and laser systems and shall be administratively required within the NHZ when engineering or procedural controls are not practicable. However, if analysis demonstrates that the MPE will not be exceeded due to an extremely short NHZ, then the LSO may not require the administrative use of LEP. LEP is usually not required for Class 2 or Class 3R lasers or laser systems except in conditions where intentional long-term (> 0.25 s) direct viewing is required. LEP may include goggles, face shields, spectacles, or prescription eyewear using special absorptive filter material or reflective coating (or a combination of both) to reduce the potential ocular exposure. Information for obtaining laser protective eyewear can be found on the Berkeley Lab Laser Safety web page. LEP shall be specifically selected to withstand either direct or diffusely scattered beams, depending upon the anticipated circumstances of exposure. The following factors shall be considered when selecting the appropriate LEP to be used: laser power and/or pulse energy, wavelength(s) of laser output, potential for multi-wavelength operation, need for prescription glasses, comfort, and fit. Laser protective eyewear can either be full protection or alignment style. For all routine laser operations and for most laser alignment procedures, the LEP used shall provide full protection against a possible direct or specular reflection exposure. Full protection LEP must be worn whenever working with solely invisible beams. If point source diffused values are employed in LEP selection by the LSO, notification to the end user shall indicate that the wearer of same is not protected against a point source intrabeam exposure as its MPE values will be exceeded. The LEP shall be clearly labeled with the optical density (OD) and wavelength for which protection is afforded. The OD for the eyewear is specified by the LSO. In addition, the laser user may choose to use distinctive identification of LEP in a multi-laser environment to aid users in the selection of approved eyewear. The visible luminous (light) transmission (VLT) of the protective filter as well as the comfort, fit, and need for prescription glasses must be considered in the choice of eyewear. When VLT is less than 20%, there may be insufficient light to perform the intended task. For high-powered multi-kilowatt lasers, engineering controls shall be implemented first. If engineering control measures are impractical, administrative control measures may be used. The skin of the face may receive a significant injury. Most of the radiant energy absorbed by the filter material of the LEP is transformed into heat. If the radiant flux is quite high, as it would be for multi-kilowatt beams, the heat may fracture a glass lens or melt polycarbonate. The user shall be trained to understand potential early signs of eyewear damage. Recent studies have indicated that existing laser eye protective filters (polycarbonate, glass, interference, or hybrid filters) often exhibit nonlinear effects (e.g., saturable absorption) that can reduce the optical density when exposed to ultrashort (e.g., Q-switched, picosecond and femtosecond) pulse durations. Laser users should request test data from laser eyewear manufacturers. When applicable, the LSO shall ensure that LEP utilizing absorbing dyes (including hybrid filters) have been evaluated for the potential for saturable absorption and consult ANSI Z136. 7 as part of the pre-purchase review. The angle of exposure can have an effect on the effectiveness of the eyewear filter. Dielectric coatings on laser protective eyewear are designed to deliver the labeled OD within a set angle of acceptance. A laser radiation incident upon the eyewear outside that angle will yield a different OD. The eyewear must be stored in such a manner as to protect its physical integrity. The LEP shall be cleaned and inspected periodically and prior to each use to ensure that it is in good condition. When cleaning the lenses of LEP, care should be taken to avoid damage to the absorbing and reflecting surfaces. During the inspection, attention should be given to the frame mechanical integrity, stretching of the head strap, and particularly for any crazing, pitting, cracking, and discoloration of the attenuation material. Eyewear in suspicious condition should be tested for acceptability or taken out of service. There must be sufficient number of laser protective eyewear on hand for users and expected visitors, and be available for inspection by the LSO during periodic visits. In the research setting, there may be times when no commercial laser protective eyewear is available to meet experimental needs. At these times, the user and LSO must re-examine beam controls and, if necessary, select alternative protective eyewear. Use of alignment eyewear shall be only for specific alignment procedures with visible beams (400–700 nm) that have been appropriately evaluated and authorized. This eyewear reduces but does not completely block the visible spectrum. It does allow the user to see the beam and therefore perform laser alignment (adjustment) activities. For continuous wave lasers, the alignment OD shall reduce irradiance to a Class 2-3R level. For pulse lasers, the alignment OD shall be no more than 1.4 less than the full protection OD (per ANSI Z136.8). Ultimately, the LSO shall approve the selection of alignment eyewear. Skin protection can be best achieved through engineering controls. In some cases, a face shield, gloves, laboratory jacket, or coat with long sleeves may fulfill the requirement, although tightly woven, flame-retardant fabrics (e.g., welder’s gloves) provide the best protection for Class 4 lasers. For wavelengths greater than 1400 nm, “large area” exposures can cause heat loading, causing skin dryness, and with excessive exposures, may lead to heat stress. In these cases, personnel exposures shall be minimized. Particular care shall be taken when using UV lasers or laser systems. Exposure to UV radiation shall be minimized by using beam shields, and perimeter guards along with face shields and long-sleeve clothing that attenuate the specific UV wavelengths to levels below the applicable MPE. Most gloves (e.g., nitrile and latex) will provide some protection against laser UV radiation. Do not use vinyl gloves for UV protection. Skin covers and /or "sunscreen" creams are recommended. In some laser applications, such as use of excimer lasers operating in the UV, the use of a skin cover shall be employed if chronic (repeated) exposures are anticipated at exposure levels at or near the applicable MPEs for skin. Special attention shall be given to the possibility of producing undesirable reactions in the presence of UV radiation, e.g., the formation of skin-sensitizing agents, ozone, and LGAC. PPE shall be used when working with open beam Class 3B and Class 4 lasers. This shall include both eye and skin protection. Whenever lasers are used in confined space and LGAC are present, respiratory protection may be needed. Contact the Industrial Hygiene group for assistance. Sign dimensions, letter size, font, layout, color, etc., shall be in accordance with the ANSI Z535 series (e.g., ANSI Z535.2 Environmental and Facility Safety Signs). Laser Controlled Area warning signs shall be of the three-panel format unless additional panels are needed for a second language. The top panel shall contain the safety alert symbol as well as the signal word. The other two panels shall contain the laser radiation hazard safety symbol and the message panel. Danger. The signal word "Danger" indicates that death or serious injury will occur if necessary control measures are not implemented to mitigate the hazards within the Laser Controlled Area (Figure 1a). This signal word shall be restricted to those Class 4 lasers with high (e.g., multi-kilowatt) output power or pulse energies with exposed beams. Warning. 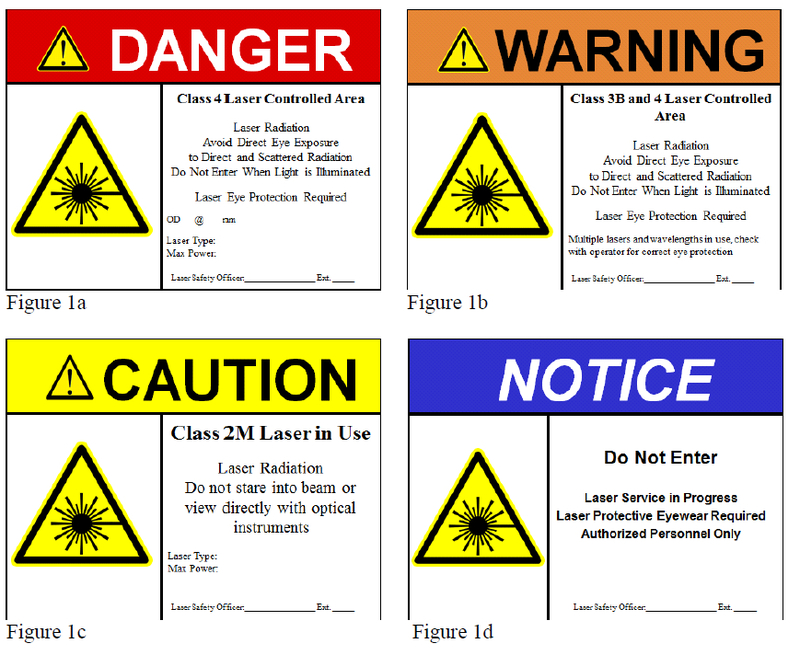 The signal word "Warning" shall be used on laser area warning signs associated with lasers and laser systems whose output exceeds the applicable MPE for irradiance, including all Class 3B and most Class 4 lasers and laser systems (Figure 1b). Caution. The signal word "Caution" shall be used with all signs and labels associated with Class 2 and Class 2M lasers and laser systems that do not exceed the applicable MPE for irradiance (Figure 1c). Notice. The signal word “Notice” is the preferred signal word to address practices not related to personal injury. This signal word shall not be associated directly with a hazard or hazardous situation and shall not be used in place of "Danger," "Warning,” or "Caution” (Figure 1d). The hazard class of the Laser Controlled Area. The highest hazard class of the laser or lasers within the Laser Controlled Area. Additional information such as type of laser, pulse duration (as appropriate), and maximum output may be included. Class 2, 2M, 3R Laser Areas: An area that contains Class 2, 2M, 3R lasers or laser systems, except as for the laser pointers, should be posted with the appropriate Caution sign. Class 3B or Class 4 Laser Area: An area that contains a Class 3B or Class 4 laser or laser system shall be posted with the appropriate Warning or Danger sign. Temporary Laser Controlled Area (Class 3B and Class 4): The exterior boundary of a temporary Laser Controlled Area shall be posted with a Notice sign in addition to the Warning or Danger posting. The LSO or DLSO must approve the warning signs before posting. The LSO, with input from the activity lead, will determine whether Class 4 lasers and laser systems should have a Danger or Warning area sign. All signs shall be conspicuously displayed in locations where they will best serve to warn onlookers. Laser controlled area signs prepared in accordance with previous revisions of ANSI Z136.1 standard are considered to fulfill the requirements. For Class 2 lasers and laser systems, "Laser Radiation ­­­­­­— Do Not Stare Into Beam." For Class 2M lasers and laser systems, "Laser Radiation — Do Not Stare Into Beam or View Directly with Optical Instruments"
For Class 3R and Class 3B lasers and laser systems, "Laser Radiation — Avoid Direct Eye Exposure to Beam"
For Class 4 lasers and laser systems, "Laser Radiation — Avoid Eye Exposure to Direct or Scattered Radiation; Avoid Skin Exposure to Direct Radiation"
All equipment warning labels shall be conspicuously displayed in locations on the equipment where they will best serve to warn onlookers. Each laser activity involving Class 3B and 4 lasers and laser systems authorized by a WPC shall be evaluated periodically by the LSO or the DLSO. Each laser operation must be assessed at the time of WPC Activity renewal. Significant changes in operation or changes that increase the hazard level may warrant a more frequent assessment. Each assessment must be documented. The preferred form of documentation is the Berkeley Lab Laser Operations Safety Audit Form, which is available on the Laser Safety web page. Affiliates, visitors, and employees without Berkeley Lab-approved laser safety training (or with incomplete laser safety training) may use lasers ONLY under the line-of-sight supervision of an authorized Berkeley Lab laser user. New users may work under these conditions for a maximum of 60 days before completing the training and medical surveillance requirements. Chapter 31, sJHA Process – Subcontractor Job Hazards Analysis, of PUB-3000 defines the process for outside service and repair providers, including laser products. The activity lead, supervisor, or laser owners are responsible for ensuring that subcontractor controls and authorizations are in place before work starts and that subcontractors follow all specified requirements. Laser users are responsible for the safety of these individuals and their compliance with Berkeley Lab safety rules. The activity lead or laser user must provide an orientation to the service and repair providers on the hazards in the Laser Controlled Area and brief them on the WPC controls. Additional training requirements are listed in Work Process F and Work Process G of this PUB-3000 chapter. Laser systems involving the general public should be Class 1, 1M, 2, 2M, or Class 3R, when practical. Only Class 1 lasers or laser systems must be used for general public demonstration, display, or entertainment in unsupervised areas without additional requirements. For outdoor laser use, ANSI Z136.6 and FAA Order JO 7400.2 must be followed. Laser light show demonstrations that use Class 3B or 4 laser systems to create visible open beams shall coordinate with the FDA prior to use. Contact the LSO for evaluation prior to operating a laser where the general public may be exposed. Laser systems that employ optical fiber cables containing all hazardous laser radiation shall be considered enclosed systems with the optical cable forming part of the enclosure. Optical fibers or optical fiber cables attached to Class 3 B or Class 4 lasers or laser systems shall not be disconnected prior to termination of transmission of the beam into the fiber. This does not apply to optical fiber systems used for telecommunication systems that have been reviewed by the LSO to ensure appropriate exposure-prevention controls are in place. If disconnection of a connector results in accessible laser radiation being reduced to below the applicable MPE by engineering controls, connection or disconnection may take place in an uncontrolled area, and no other control measures are required. However, when the system provides access to laser radiation above the applicable MPE via a connector or connection, disconnection during service, maintenance, or modification shall take place only in an appropriate temporary Laser Controlled Area or Laser Controlled Area. When a connection or disconnection is made by means of a connector, other than one within a secured enclosure, such a connector shall be disconnected only by the use of a tool. When the connection or disconnection is made within a secured enclosure, no tool for connector disconnection is required, but a warning sign appropriate to the class of laser or laser system shall be visible when the enclosure is open. OFCS is an engineered assembly for the generation, transference, and reception of optical radiation arising from lasers or light-emitting diodes (LED) in which the transference is by means of optical fiber for communication purposes. OFCS are designed to operate normally as Class 1 systems with the laser energy contained within the optical fiber(s) during the intended use. However, there may be a risk of exposure above the MPE during installation and service of such systems or in the event of a fiber disconnect or break. Because the radiant energy emitted from an optical fiber is usually divergent, the risk of injury is different from that of a conventional laser operating at the same optical power and wavelength. To address this difference, the basic classification scheme in ANSI Z136.1 has been augmented by the establishment of system classification in terms of hazard levels. The seven hazard levels are Hazard Level 1, 1M, 2, 2M, 3R, 3B, and 4. OFCS also have limitations that are dependent on the location type in which they are installed. Detailed information, definitions, and control measures can be found in ANSI Z136.2 Safe Use of Optical Fiber Communication Systems Utilizing Laser Diode and LED Sources. In cases where laser radiation above the applicable MPE can be made accessible by disconnection of a connector, the connector shall bear a label or tag with the words "Hazardous Laser Radiation When Disconnected." Appropriate procedures (such as lockout/tagout procedures at the laser source) should be instituted to prevent inadvertent personnel exposure from an unterminated or severed fiber. For Hazard level 2: "Caution: Disconnected Optical Connectors May Emit Optical Radiation. Do Not Stare Into Beam." For Hazard level 1M, 2M and 3R: "Caution: Disconnected Optical Connectors May Emit Optical Radiation. Do Not View Beam With Optical Instruments." For Hazard level 3B: "Warning — Disconnected Optical Connectors May Emit Optical Radiation. Avoid Direct Exposure to the Beam." For an area with a large number of connectors, e.g., an equipment bay or cable closet, the label must be located in plain view on the equipment in the vicinity of the connectors, e.g., outlets, patch panels, patch cords. Do not stare into fiber connectors, the ends of broken fibers, or into laser beams with the naked eye or with any optical aid. Verify that no laser light is present prior to observing fiber with optics. Cover exposed end of optical fiber (disconnected fibers or cable break) with a suitable cap or cover to block emission and protect the end of fiber. Use appropriate PPE such as gloves, face shields, aprons, and safety glasses, when performing splicing operations. Use containers for sharps when performing splicing operations. Do not eat or drink in areas used for fiber-splicing operations. All controls applicable to Class 3B and 4 lasers apply for Hazard level 3B and 4 OFCS. Contact the LSO for evaluation before taking Hazard level 3B and 4 OFCS into operation. The emission pattern of an optical fiber connected to a diode or LED is highly divergent, unlike that of a conventional laser, unless lens connectors are used. Therefore, the beam irradiance (hence any risk for eye injury) decreases rapidly with distance from the end of the fiber or output connector. Because of the beam divergence, inadvertent viewing of the accessible emission from a disconnected energized fiber with unaided eye at a distance greater than 10 cm from Hazard Level 1M, 2M, or 3R OFCS normally will not cause eye injury but damage may occur under optically aided viewing conditions. Eye injury may also occur for unaided viewing of the accessible emission from Hazard Level 3B OFCS, especially when lens connectors are used. OFCS that utilize LEDs generally emit non-coherent radiant energy at wavelengths greater than 0.7 micrometer and power levels considerably less than laser-diode sources. Since the potential of injury is determined by the output characteristics of the OFCS, including power, wavelength, and beam divergence, the potential risk for injury is, therefore, generally less for an LED system than for a similar system utilizing laser diodes. However, for the purposes of uniformity, all control measures commensurate with a specific hazard level apply to both laser diode systems and LED systems. In each site where optical energy is transmitted, crossing into, or received, respective exposure conditions must be individually evaluated and ANSI Z136.2 consulted. Contact the LSO for evaluation before use of FSOCS. The design or control measures in combination provide for a positive beam termination during operation. The beam geometry is limited to only the necessary work task. All workers are located at a distance greater than or equal to the lens-on-laser NHZ value for the laser robotic system. In many cases, the beam path to the target material is very short (less than 3 cm). In these cases, service and maintenance functions typically present the greatest NHZ. In many instances, including those created by hardware failure and software errors, the laser beam from robotic delivery systems can be incidental on the target surface at angles that could lead to potential scattering geometries that are very complex and require extensive evaluation. Measurements are often required to confirm the NHZ boundaries. Contact LSO for evaluation before taking laser robotics into operation. No unattended operation is permitted unless additional controls are in place. When an actual laser transmission is not required, such as when a laser is left unattended for a substantial period of time (e.g., during lunch break, overnight, or at change of shifts), the laser shall be turned off, or beam shutters or caps shall be utilized. When it is raining or snowing, or when there is dust or fog in the air, the operation of laser systems shall be prohibited where practicable. A construction worker who is operating a laser must be trained and qualified to operate the laser equipment he/she is operating. For Class 3R or lower lasers, this can be accomplished through on-the-job training (OJT). The laser equipment operator shall be familiar with the applicable manufacturer recommendations and various hazards associated with the use of the equipment and the necessary or recommended control measures for the elimination of hazards to personnel. The OJT will serve as qualification documentation and should be maintained on the construction site or uploaded in the WPC Activity Manager database so that the records are available for review by the LSO or another compliance officer. Where lasers are used on construction sites, proper warning signs shall be posted to alert workers of their use. The LSO can assist in selecting proper area signage. Laser pointers shall not exceed the Class 3R AEL and are exempted from the area posting. Laser pointers are effective tools when used properly. Users of laser pointers should be aware of the potential hazards and follow the recommended safety precautions. Momentary exposure from a laser pointer might occur from an inadvertent sweep of the light across a person’s eyes, and may cause temporary effects such as glare, after-image, and flash blindness. However, even this can be dangerous if the exposed person is engaged in a vision-critical activity, such as driving or flying an aircraft. When choosing a laser pointer, try to select a Class 2 laser, as it has lower-power emissions. Most commercially available laser pointers, however, are Class 3R. When possible, purchase red-light laser pointers, and avoid using green- or blue-light laser pointers, as these may emit invisible light in addition to the visible light if the infrared (IR) blocking filter is missing. Be aware that laser pointers may emit power levels above what is marked on the label. Do not look directly into the laser beam. Do not point a laser beam at a person. Do not view a laser pointer using an optical instrument, such as binoculars or a microscope. Do not use Class 3B or Class 4 lasers as laser pointers, as these are illegal in the United States. Verify that the laser pointer has proper warning labels applied by the manufacturer. Consider having the laser pointer power output tested by the LSO to verify that the laser pointer has a maximum output or 5 mW or less (the lower, the better). Be aware that laser pointers that have not been tested by the LSO may emit power levels above what is marked on the label. The nomenclature for the classification of lasers was changed between the 2000 and 2007 versions of ANSI Z136.1. The revision of ANSI Z136.1-2014 has the same nomenclature as 2007. Lasers purchased after 2007 will usually have manufacturers’ labels that conform to the updated requirements. To minimize confusion, both systems will be considered acceptable until equipment with obsolete labels is removed from the inventory by attrition. The classification of lasers must be based on maximum output available for intended use in each wavelength region of operation. This document will use the current 2014 nomenclature. The table below displays the differences. The LSO or DLSO must approve the purchase of all lasers and laser protective eyewear. To ensure that all requests for laser purchases come to the LSO for approval, the Procurement & Property Department provides a separate code “Laser Equipment” (410000R5) in the Purchasing Guide. All Class 3B and Class 4 laser users who will be at Berkeley Lab for more than 60 days must complete a baseline laser eye examination. Berkeley Lab Health Services performs this examination in Building 26. Examinations performed outside Berkeley Lab may be submitted to Health Services for approval. Periodic re-examinations are not required. Laser eye examinations will be performed as follow-up to accidental eye exposure or if an eye injury is suspected. They may also be performed at the request of the LSO or user. It is recommended that the laser user receive an additional laser eye examination on termination of employment. An optometrist or ophthalmologist must administer the examination complying with the ANSI Z136.1 requirements. Completion of these examinations is tracked as EHS0288 Laser Eye Exam in the training database. For more information, call Health Services at extension 6266 or see PUB-3000 Chapter 3, Health Services. Skin examination For those who routinely receive ultraviolet exposure as part of their experimental work, an annual skin evaluation is recommended. The level of training shall be commensurate with the degree of potential laser hazards, both from the laser radiation and non-beam hazards. When classroom-based laser safety training is utilized, the LSO will verify the trainer qualifications before he/she is appointed as a trainer. Where appropriate, training shall include cardiopulmonary resuscitation (CPR) and safety procedures for applicable non-beam hazards associated with laser systems in use. The required training courses will be listed in the WPC Activity Manager. Fiber Optics Safety is mainly for staff involved in fiber-optic communications. Laser Safety Training is a Web-based course covering the fundamentals of laser safety. It is required for users of Class 3B and or Class 4 lasers. Refresher training must be completed every 3 years by retaking the online EHS 302 training. OJT may be a prolonged process. The activity lead must ensure that all personnel, visitors, and students with access to the Laser Controlled Area have a clear understanding of the controls associated with laser operation and that the relevant laser-safety procedures are diligently followed. The extent of OJT must be tied to the individual responsibilities and degree of hazard. It can apply to the entire experiment or only to specific elements of the research work (specific laser systems or experimental operations). The completed OJT must be documented either electronically in the WPC activity (preferred way) OR on an OJT form. An example OJT form may be found on the laser safety web page http://www2.lbl.gov/ehs/safety/lasers/forms.shtml. The form can be modified to reflect the provided training. It is recommended that the scanned form be uploaded to the WPC activity for record keeping. Any visitor or affiliate must be provided with a safety orientation to the lab space prior to entering the lab. Examples: laser scanning confocal microscope, cell sorter, laser interferometer. The Center for Devices and Radiological Health (CDRH) is the FDA body tasked with developing laser light performance product-safety standards. The CDRH defines a Class 1 product as any laser product that does not permit access during the operation to levels of laser radiation harmful to eyes or skin. Class 1 levels of laser radiation are not considered hazardous. Class 1 system (certified product) may contain embedded Class 3B and 4 lasers. Therefore, when open for service, these Class 1 laser systems may introduce a potential laser hazard in work areas and to staff unaccustomed to the laser-safety considerations. During routine operation of a Class 1 system where laser radiation exposure is not possible, laser safety training, medical surveillance, or user restrictions from a laser-safety perspective are not required. Each unit should have an individual responsible for its proper use. A protective housing that encloses Class 3B or 4 lasers or laser systems shall be provided with an interlock system that is activated when the protective housing is opened or removed during operation and maintenance. The interlock shall be designed to prevent access to laser radiation above the applicable MPE. The interlock may, for example, be electrically or mechanically interfaced to a shutter that interrupts the beam when the protective housing is opened or removed. Fail-safe or redundant interlocks must be provided for any portion of the protective housing that, by design, can be removed or displaced during operation and maintenance, and thereby allow access to Class 3B or 4 laser radiation. If the interlock can be bypassed or defeated, a warning label with appropriate indications shall be located near the interlock. The interlock design shall not permit the service access panel to be replaced with the interlock remaining bypassed or defeated. Servicing or maintenance on Class 1 laser systems may require removal of panels or protective housings, overriding of protective housing interlocks, or entry into the NHZ; therefore, accessible laser radiation may exceed the applicable MPE. In those conditions, control measures appropriate to the class of embedded laser(s) must be implemented, and a temporary Laser Controlled Area shall be established for the laser or laser system. The LSO will evaluate the hazard and will ensure the necessary administrative controls are prescribed in a Temporary Work Authorization (TWA). The LSO shall confirm that service personnel have the safety training commensurate with the class of the laser or laser system contained within the protective housing. Prior to performing the service, email or fax the activity lead or Berkeley Lab LSO a copy of his/her laser safety training certificate indicating the training was completed within the last three years through the service provider’s current employer, or take the Berkeley Lab laser safety training course EHS0302. A letter from the employer’s LSO or service manager is also acceptable. Follow procedures for control of hazardous energy when the LSO determines that Lock Out/Tag Out (LOTO) is required to prevent potential exposure to stored hazardous laser energy. During service and maintenance, a "Notice ­— Laser in Service" warning sign shall be posted. The sign may be obtained from the LSO or printed from the Laser Safety web page. By their classification or definition, and when used as intended, these lasers or laser systems will not present a hazard to the user or those around them. Enclose laser beams as much as possible. Position lasers so no beam or hazard exists at the room’s entrance. Confine all laser beams to a well-defined area of use. Terminate the beam at the end of its useful path. Position the beam path at a height other than eye level whenever practical. Block unnecessary beam reflections and remove shiny objects (e.g., jewelry, tools) that may cause unexpected reflections. Do not modify the interlock on removable protective housing. The interlock must be functional during normal operation. Do not remove filters, beam blocks, or other mechanisms designed to attenuate the beam. Do not modify the system as certified by the manufacturer. Adding lasers or modifying the system may invalidate the certification as a Class 1 product. Any proposed changes must be discussed with the LSO. Class 2, 2M, and 3R laser or laser systems (except laser pointers) should be posted with "Caution" warning signs when used. Contact the LSO for appropriate signage. Verify that a protective housing is provided and a warning label with the laser sunburst symbol, a cautionary statement, the hazard class, and the power or energy output is affixed. If no label is present, contact the LSO for evaluation. Authorization to use Class 3B or Class 4 lasers or laser systems is granted to laser users through a formal authorization process using the Work Planning and Control (WPC) Activity Manager database. The authorizing document is referred to as an Activity (see Chapter 6, Work Planning and Control, of PUB-3000). The Class 3B and Class 4 laser or laser system hazard control measures are intended to prevent exposure to hazardous levels of laser radiation for all individuals who may enter the Laser Controlled Area. Control measures are divided onto three groups: engineering, administrative (procedural), and personal protective equipment (PPE). Engineering controls should be the first line of defense in implementing controls to mitigate a laser hazard, followed by administrative controls, and then PPE. Enclosure of the laser equipment or beam path is the preferred method of control, since the enclosure isolates or minimizes the hazard. If engineering controls are impractical or inadequate, an effective combination of administrative controls and PPE shall be used. Upon review and LSO approval, the control measures may be replaced by other controls that provide equivalent protection. If alternate control measures are used, the personnel directly affected shall receive appropriate training. A laser hazard evaluation and analysis shall be affected by the LSO for all Class 3B and 4 lasers and laser systems, and for any laser systems of lower hazard class containing embedded Class 3B and 4 lasers if manufacturer-provided controls will be bypassed or modified. If the analysis determines that the maximum level of accessible radiation is Class 3B or Class 4, then a Laser Controlled Area shall be established and adequate control measures instituted. Class 3B and 4 lasers and laser systems shall be operated, maintained, or serviced only by authorized personnel. The authorized personnel are the staff who have met Class 3B and Class 4 user requirements, and have been trained in laser safety and in the operation of the laser or laser system. Approved laser eyewear will be worn as required. All Class 4 LCAs or entryway safety controls shall be designed to allow both rapid egress by laser personnel at all times and admittance to the LCA under emergency conditions. For emergency conditions there shall be a clearly marked “Emergency Stop” or other appropriately marked device suitable for the intended purpose of deactivating the laser or reducing the output to levels at or below the applicable MPE. After completion of the hazard evaluation, the LSO and the activity lead will determine the most appropriate entryway access control approach. Non-defeatable (non-override) entryway safety controls: Non-defeatable safety latches, entryway or area interlocks (e.g., electrical switches, pressure sensitive floor mats, infrared or sonic detectors) must be used to deactivate the laser or reduce the output to levels at or below the applicable MPE in the event of unexpected entry into the Laser Controlled Area. Defeatable entryway safety controls: Defeatable safety latches entryway or area interlocks must be used if non-defeatable area/entryway safety controls limit the intended use of the laser or laser system. For example, if it is clearly evident that there is no laser radiation hazard at the point of entry during normal usage requiring operation without interruption, override of the safety controls must be permitted to allow authorized personnel access provided they have been adequately trained and equipped with adequate personal protective equipment. All authorized personnel shall be adequately trained, and adequate personal protective equipment shall be provided upon entry. A door, blocking barrier, screen, curtains, etc., must be used to block, screen, or attenuate the laser radiation at the doorway. The level of laser radiation at the exterior of these devices shall not exceed the applicable MPE, nor shall personnel experience any exposure above the MPE immediately upon entry. At the entryway, there shall be an area warning device indicating that the laser is energized and operating at Class 4 levels. When the WPC Activity is in active status for the Laser Controlled Areas equipped with entryway interlock, the functional interlock test must be completed at least annually. The test must be documented and follow a written procedure. Any particular problems and corrective actions should be documented. Notify the activity lead and LSO of any failures/problems. An example of a test documentation form may be obtained from the Laser Safety web page. Prior to arming interlock verify that the laser is in working order. With door (s) closed, arm interlock (switch on). Check that the interlock illuminated sign(s) at area entrance turns on (if applicable). Hold open the door to see that system shuts off after a time delay (generally 15 seconds)..
Reset interlock after each step/shutter drop. If the laser is blocked by shutter(s), see that they drop each time. Test emergency crash button (both outside and inside, as appropriate). Test each door of the lab. Check each interlock bypass, if equipped, to see that it works. All laser beams must be contained within the optical table. This can be accomplished through beam blocks, perimeter guards, complete table enclosures, etc. Any exceptions to this (e.g., beam-crossing walkways, beams from one room to another, vertical beams) must be carefully planned, and associated hazards mitigated. All upward vertical beams must have a beamstop or other means to terminate beams that might miss mirrors during alignment. The exposed beam path for Class 3B should — and for Class 4, must — be above or below eye level of a person in any standing or seated position. Any primary beams and potentially hazardous reflections must be terminated in a beamstop of an appropriate material. The beamstop must be of an appropriate size to dissipate absorbed energy. Use only diffusely reflecting materials in or near the beam path, where feasible. Laser users must confine all laser beams to the Laser Controlled Area. This can be accomplished by curtains, barriers, perimeter guards, or beam blocks. Any exceptions to this (beams from one room to another, beams across shielding walls or outside applications) must be carefully planned, and associated hazards mitigated (e.g., by enclosed tubes, labeled beam blocks, etc.). A protective housing shall be provided for all classes of lasers or laser systems. The protective housing may require interlocks and labels. If a user-created enclosure is not interlocked, it shall be considered a barrier or curtain. A label shall be placed on each removable protective housing that does not have a safety interlock and that can be removed or displaced during operation, maintenance, or service. Long-distance beam conduits that contain beams operating above the Class 1 level shall be labeled at appropriate intervals (~3 m) to provide warning of the relative hazards of laser radiation within the conduit. All laser equipment shall have appropriate warning labels affixed to a conspicuous place on the laser housing or control panel. If a laser is operated without a protective housing, the LSO shall conduct a hazard analysis and ensure that adequate engineering control measures are implemented. The engineering controls may include, but are not limited to barriers, shrouds, beam conduits, and beamstops. Class 3B or 4 lasers or laser systems should be provided with a master switch. This master switch shall effect beam termination and/or system shutoff and must be operated by a key or by a coded access (such as a computer code). A single master switch on a main control unit is acceptable for multiple laser installations where the operational controls have been integrated. The LSO is the Authority Having Jurisdiction (AHJ) to monitor and enforce the control of hazardous laser radiation and will determine if the implemented controls are sufficient or Lock Out/ Tag Out (LOTO) is required. In most cases of normal laser system operation, LOTO is not required to control hazardous laser energy. Routine daily tasks by laser users in the LCA are defined as normal energized operations. Normal operations include alignment of energized or partially-energized laser equipment within its intended function. Laser and optics alignment by laser users, including creating new beam paths and replacing damaged optics, are tasks that are considered routine, repetitive and integral to normal operations for trained laser users. Other examples of normal operations are constructing, installing, setting up, adjusting, inspecting, and modifying the beam path. For additional details, see the Implementation Guide listed in the References section. All viewing windows and diffuse (reflective or transmitted) display screens included as an integral part of a laser or laser system must incorporate a suitable means (such as interlocks, filters, or attenuators) to maintain laser radiation at the viewing position at or below the applicable MPE as determined by the LSO. All laser protective viewports and films sold other than as an integral part of a product should be labeled with optical density at the spectral region for which protection is afforded. This information shall be obtained from the original equipment manufacturer. Facility windows (exterior or interior) that are located within the NHZ of a Class 3B or 4 lasers must be provided with an appropriate absorbing filter, scattering filter, blocking barrier, or screen that reduces any transmitted laser radiation levels below the applicable MPE. The laser windows must be specifically selected to withstand direct and diffusely scattered beams. The window barrier must exhibit a damage threshold for beam penetration for a specified exposure time commensurate with the total hazard evaluation. All laser protective windows, sold other than as an integral part of a product, must be labeled with the optical density and wavelength for which protection is afforded. Such protective windows should also be labeled with the exposure time for which the limit applies and the condition under which protection is afforded. A blocking barrier, screen, or curtain that can block or filter the laser beam at the entryway should be used inside the Laser Controlled Area to prevent the laser radiation from exiting the area at levels above the applicable MPE. Laser barriers shall be specifically selected to withstand direct and diffusely scattered beams. The barrier shall exhibit a damage threshold for beam penetration for a specified exposure time commensurate with the total hazard evaluation. All laser protective barriers, sold other than as an integral part of a product, must be labeled with the barrier exposure time for which the limit applies and the beam exposure conditions under which protection is afforded. When selecting barriers, the material’s flammability and decomposition are important important factors to consider. It is essential that the barriers not support combustion or the release of toxic airborne contaminants following a laser exposure. All collecting optics (e.g., lenses, telescopes, microscopes, endoscopes, and eye loupes) that integrate the use of a laser or laser system must incorporate suitable means, such as interlocks, filters, and attenuators, to maintain the laser radiation transmitted through the collecting optics at levels at or below the applicable MPE, as determined by the LSO. All permanently mounted collecting optics housings containing laser protective filters sold other than as an integral part of a product shall be labeled with the optical density and wavelength for which protection is afforded. All collecting optics filter housings should also be labeled with the threshold limit and exposure time for which the limit applies and the condition under which protection is afforded. Fully Open Beam Path: In applications of Class 3B or 4 lasers or laser systems where the beam path is fully open, the LSO shall conduct a laser hazard evaluation. The total hazard assessment may be dependent upon the nature of the environment, the geometry of the application, or the limitations of other hazards associated with the laser use. Limited Open Beam Path: In applications where the beam path is confined by design to limit the accessibility of the open beam, the LSO shall conduct a hazard evaluation. The analysis will define the area where the laser radiation is accessible at levels above the appropriate MPE and will define the appropriate control measures in that area. The LSO shall establish controls appropriate to the magnitude and extent of the accessible radiation. Class 1 Condition: In some cases, the hazard analysis will define an extremely limited NHZ, and procedural controls can provide adequate protection. Class 1 conditions shall be considered as fulfilled for those limited open beam path lasers or laser systems where analysis, including measurements when necessary, confirms that the accessible levels during operation are at or below applicable MPE levels. Enclosed Beam Path: In laser or laser systems applications where the entire beam path is enclosed and the enclosure fulfills all requirements of a protective housing (i.e., the enclosure or the interlocked housing limits exposure to levels at or below the applicable MPE) the requirements of Class 1 system are fulfilled, and no further controls are required. When the protective housing requirements are temporarily relaxed, such as during service, the LSO shall implement the appropriate controls. These may include establishing a temporary Laser Controlled Area and instituting appropriate administrative controls. A Class 3B Laser Controlled Area should ­— and a Class 4 Laser Controlled Area must — have an area warning device that is visible prior to entering the area. The purpose of the area warning device is to ensure that persons who are about to enter the controlled area are aware that a laser is emitting — or is beginning to emit — laser radiation within the area. A visible warning device is any device, mechanical or electrical, that indicates when the laser is operating. Examples include a single lamp or a laser warning sign that is illuminated or flashes when the laser is operating. The visible warning device must be visible through laser eye protection. The light or illuminated sign can be electrically interfaced and controlled by the laser power supply so that the light is on only when the laser is operating. Within the Laser Controlled Area, an audible or visible radiation emission warning device (or emission indicator) should be used with Class 3B — and must be used with Class 4 lasers or laser systems — during activation or startup. The purpose for this radiation emission warning is to ensure that persons already within the Laser Controlled Area are aware that a laser is emitting. The most common laser radiation emission warning device is a single (red) light located on the laser or its control panel. In cases where the emission indicator is not visible everywhere within the controlled area, the LSO will determine if adding another indicator is required, such as a warning light or illuminated sign that is viewable within the Laser Controlled Area and indicates that the laser is operating. This light could be electrically interfaced and controlled by the laser power supply so the light is on or flashing only when the laser is operating. This indicator should be visible through laser protective eyewear. Administrative controls are methods or instructions that specify rules or work practices, or both, in order to mitigate the potential hazards associated with laser use. 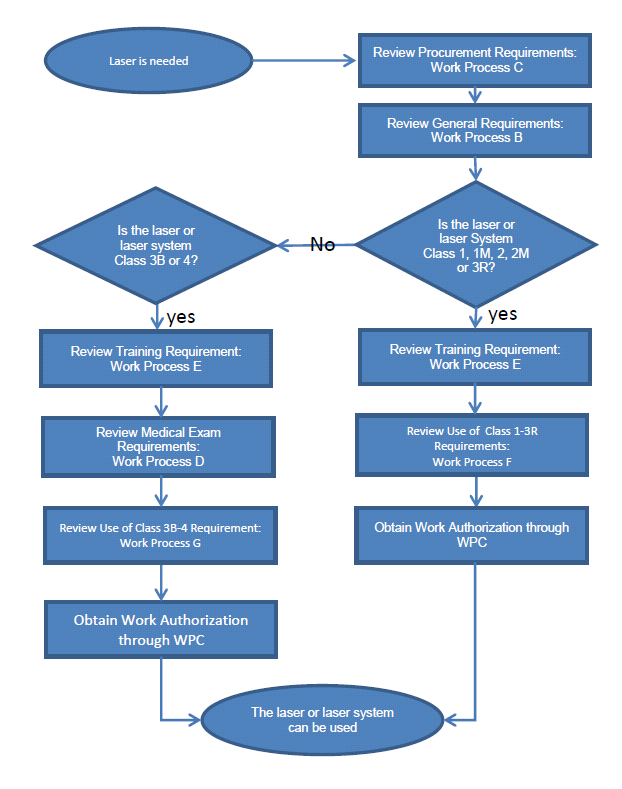 A WPC Activity Manager Work Authorization serves as a standard operating procedure (See (PUB-3000 Chapter 6). The Activity Manager Work Authorization requires line management to define the scope of work for each activity, determine the hazards of that work, and review and refine the controls prescribed for those hazards. The LSO has an active role in evaluating the laser hazards and prescribing the controls mitigating them. The documentation of that evaluation and analysis of the assigned tasks, once fully approved by line management, serves as the Work Authorization for the individual assigned to perform the work. The Work Authorization document is maintained as an electronic record in the Activity Manager database. The LSO must require and approve the Work Authorizations covering the work with Class 3B and 4 lasers. Education and training shall be provided for operators and maintenance and service personnel for Class 3B or 4 laser systems, as well as for those laser systems with embedded Class 3B or 4 lasers where beam access by employees is required during maintenance and/or service. The level of training shall be commensurate with the level of potential hazard. Detailed training requirements are listed in Work Process E of this PUB-3000 chapter. All areas where Class 3B or 4 laser systems operate shall be posted with warning signs containing the “Warning” or “Danger” signal word (per LSO determination and with the input of the activity lead) and appropriate instructions regarding the hazard of entry into the space when no operator is present. The LSO or DLSO must approve the warning signs before posting. Laser users must notify personnel in the Laser Controlled Area of any changes in laser operational status prior to turning on the laser system, such as when opening/closing shutters, removing beam blocks, or performing any actions that might put others unintentionally at risk, including changing to wavelengths that require the use of different eyewear. The majority of laser accidents in research activities occur while aligning the laser or during similar beam-manipulation activities. All possible steps should be taken to prevent such accidents. These activities require carefully developed and detailed OJT covering hazard identification and mitigation techniques. The alignment of Class 3B or 4 laser optical systems (e.g., mirrors, lenses, beam deflectors) must be performed in such a manner that the primary beam, or a specular or diffuse reflection of a beam, does not expose the eye to a level above the applicable MPE. Written procedures outlining alignment methods should be approved by the LSO for Class 3B lasers or laser systems, and must be approved by the LSO for Class 4 lasers or laser systems. Alignments should be performed only by those who have received laser safety training, OJT, and who are authorized by their supervisor, work lead, or designee to perform laser-alignment/beam-manipulation activities unsupervised. The laser beam is never to be viewed directly, only indirectly (e.g., by webcam, charge-coupled device [CCD], IR/UV image converter viewers, phosphor cards, or a diffuse reflection from a matted surface to locate beams, etc.) with appropriate eyewear to ensure that the MPE is not exceeded. Remote-viewing approaches must always be considered. Alignment should be conducted optic-to-optic and constantly checked for stray reflections. When found, those reflections must be contained within the optical or experimental table(s), even if they are below the eye-hazard level. Alignment procedures must be performed at the lowest possible power level. The use of lower power (Class 1, 2 or 3R) visible lasers for path simulation is recommended. Place beam blocks behind optics and above upward vertical beams to terminate beams that might miss or otherwise pass beyond mirrors during alignment. Be sure all beams and reflections are properly terminated before high-power operation. The use of alignment eyewear for visible beams is allowable with the approval of the LSO. Those handling the laser must remove reflective jewelry, ID badges, etc., that may intercept the laser beam. Unnecessary personnel must be excluded from the Laser Controlled Area during alignment. During alignment procedures, appropriate area warning signs must be posted. Personnel who require access to Class 3B or 4 lasers or laser systems enclosed within a protective housing or protected area enclosure must comply with the appropriate control measures for the enclosed or embedded laser or laser system. Verify that the service provider has appropriate laser protective eyewear available, and that the eyewear is clearly labeled with the optical density and wavelength for which protection is afforded. Prior to performing service, the service provider must email or fax a copy of his/her laser safety training completed with his/her current employer within the last three years to the activity lead or Berkeley Lab LSO, or take the Berkeley Lab laser safety training course, EHS 0302. A letter from the employer’s LSO or service manager is acceptable. All visitors and spectators must be escorted while in the lab. The host must make them aware of the level of hazard and appropriate protective measures they have to take. It is the responsibility of the guest to follow instructions and limitations on their activities. No Berkeley Lab employee should work in an off-site facility where the employee feels his or her safety is at risk. If such an occasion arises, stop work and discuss with the Berkeley Lab supervisor or activity lead (line management) or local management, or contact the Berkeley Lab LSO to see what assistance Berkeley Lab can grant the host site. Safety of laser users on site is extremely important to the Laboratory. Laser safety at off-site locations (even at other DOE facilities) should be equivalent to safety at Berkeley Lab. Berkeley Lab’s laser safety responsibility on the UC Berkeley campus will extend only to the training of Berkeley Lab employees working with lasers on campus as part of their Berkeley Lab employment duties. The line management of the employee must ensure that Berkeley Lab employees working on the UC Berkeley campus receive training (including OJT) equivalent to that of Berkeley Lab employees working on site. The LSO has the discretion to grant training credit for equivalent training received on campus (or other institutions). All other laser activities on campus (including DOE-funded research involving lasers, or DOE-funded laser equipment) will be the responsibility of UC Berkeley. Operating safety procedures for lasers on campus will follow UCB requirements. Both Berkeley Lab and UC Berkeley laser safety programs are based on the ANSI Z136.1 standard and should be equivalent. The Berkeley Lab LSO may periodically visit Berkeley Lab laser users working on the UC Berkeley campus. The visits will be arranged in collaboration with the UC Berkeley LSO. Accidental or suspected laser-beam exposure is a serious event. Laser users must report all suspected or known laser accidents, no matter how minimal the accident, to Health Services (Building 26) for medical attention and evaluation. Medical examinations shall be performed as soon as practical (usually within 48 hours) when a suspected injury or adverse effect from a laser exposure occurs. In addition to the acute symptoms, consideration shall be given to the exposure wavelength, emission characteristics and exposure situation to ensure appropriate medical referral. For injury to the eye from lasers operating in the retinal hazard region, examinations shall be performed by an ophthalmologist, employees with skin injuries should be seen by a physician. After medical attention and evaluation is rendered, report the exposure to the supervisor and the Berkeley Lab LSO. The key action initially is to keep the individual calm. Stop work and turn off laser. Notify others in the area if a hazard still exists. Do not alter the laser setup (this allows analysis of the cause of the accident). Transport exposed individuals to Health Services (Building 26) for evaluation. Notify the laser user’s activity lead or supervisor and the Berkeley Lab LSO. Develop corrective actions to prevent a recurrence at any Berkeley Lab laser-use site. When appropriate, a Lessons Learned will be generated. The LSO makes a preliminary decision in an Extent of Condition (EOC). (Typically, the EOC affects only the laser laboratory directly involved in the incident, but may include other laser laboratories, depending upon the nature of the incident). The appropriate Berkeley Lab line management reviews the EOC. If line management concurs with the EOC, the affected facility or facilities are instructed to suspend operation. The LSO begins the incident investigation. If the incident meets Occurrence Reporting and Processing System (ORPS) requirements, an ORPS investigation team will also be formed. The rest of the Berkeley Lab laser-user community is notified of the incident. The LSO reviews the preliminary EOC as more information becomes available during the investigation. The appropriate line-management reviews the modified EOC. If Berkeley Lab management concurs with the modified EOC, the LSO instructs the affected laser laboratories to either close or open per the modified EOC. Step 3 of this Laser Incident Management Plan may be repeated throughout the investigation, depending on the nature of the information and causal-analysis results found by the LSO. The LSO reviews the Restart Plan. If the LSO concurs with the plan, it is sent to the LSC. The LSC reviews the Restart Plan. If the LSC concurs with the plan, it is sent to the appropriate line management for their review. If the appropriate line management concurs with the Restart Plan, the LSO notifies the affected laser users that an approved Restart Plan is ready for implementation. The Restart Plan may be phased in by users of the affected labs during an ongoing investigation. The LSO or LSC confirms completion of the Restart Plan. The affected division line management develops Lessons Learned, which are submitted to the LSO. Three to six months after the affected laboratory has been brought back online, the LSO follows up by reviewing how effectively the laboratory implemented the Restart Plan and corrective actions.